The global mobile medical apps market comprises of software applications that can be executed on a mobile platform, or a web-based software connected to a mobile platform. The intended use of medical apps is wide ranging starting from the apps helping patients, or users to self-manage their disease or conditions without providing any diagnosis or treatment related recommendations, to the apps which claim to diagnose, cure, mitigate or prevent the onset of a disease or medical condition. Mobile medical apps are often used as an accessory to a regulated medical device, and they transform a mobile platform into a medical device. With the rapid proliferation of mobile computing devices and smartphones in conjunction with growing consumer demand for mobile apps, there has been a plethora of medical apps in different online app distribution platforms such as, Google Play Store and Apple’s app store. As of 2017, there was an estimated 1,59,000 medical apps in different app stores. Mobile medical apps can significantly expose a patient or user to health risks if it ceases or fails to perform as intended. Hence, to provide guidance for the regulation of these apps, the U.S. Food and Drug Administration (FDA) for the first time issued a guidance document in the year 2015, which is particularly for the developers of mobile medical apps. The agency has already approved more than 100 medical apps in the last decade out of which around 40 medical apps were approved in the year 2015 and 2016. The FDA only intends to regulate mobile apps that pose greater risk to the patients in an event where an app fails to function as intended, and aims to exercise enforcement discretion for the mobile apps that pose minimal risks to the patients. Despite these regulatory guidelines, there are hundreds of medically themed apps in Apple's App Store and Google Play Store that claim to assess, diagnose, and take control of the personal health of the patient. The usage of these apps could prove hazardous for a patient or user as these apps are not well backed by clinical evidences, and can even mislead a patient by showing false positive results. Agencies such as FDA is considerably taking steps to withdraw these apps from the app distribution platforms, and making provisions so that these kinds of apps are not marketed as replacement for legitimate medical equipment. On the other hand, there are only a handful of medical apps that physicians or other healthcare professionals find useful in a clinical setting. These apps are cantered upon enabling doctors seeking drug related information or drug interaction (aka reference apps), and helping physicians during their clinical decision-making process. Some of the widely known and most downloaded medical apps in a clinical setting are Epocrates, PEPID, UptoDate, Medscape, and Doximity. The market report is well designed to provide an all-inclusive field of vision for the market in terms of various factors influencing it such as, recent trends, technological advancements, and regulatory environment of the market. The scope of this report is cantered upon conducting a detailed study of the solutions allied with the global mobile medical apps market. The market has been segmented into ‘Category’, ‘Type’, ‘Application’, and ‘Region’. The report presents the reader with an opportunity to unlock comprehensive insights with respect to the market, and helps in forming well informed strategic decisions. The research uncovers some of the substantial parameters that must be taken into consideration before entering into the market. 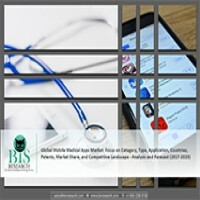 This research report aims at answering various aspects of the global mobile medical apps market with the help of the key factors driving the market, threats that can possibly inhibit the overall growth of the market, and the current investment opportunities that are going to shape the future trajectory of the market expansion. The study considers the growth-share matrix model for a comprehensive study of the global mobile medical apps market, and assesses the factors governing the same. • What are the major market drivers, challenges and opportunities in the global mobile medical apps market? • What was the market value of the leading segments and sub-segments of the global mobile medical apps market in 2016? • How will each segment of the global mobile medical apps market grow during the forecast period and what will be the revenue generated by each of the segments by the end of 2025? • How will the industry evolve during the forecast period 2017- 2025? • What are the key developments and strategies that are being implemented by the key players to sustain in this market? • What are the key application areas of the mobile medical apps market? What are the major benefits of medical apps achieved by each category? • Which medical apps are used frequently by both the patients and the healthcare providers? • What are the best rated mobile medical apps in different app categories? • Who are the key players in the mobile medical apps market and what are their contributions? • What is the total number of apps available for downloading in different medical app categories? • What is the scope for expansion by the key players of the mobile medical apps market in East and South-East Asia? The key players who have significant contributions to the global mobile medical apps market are Abbott Laboratories, AliveCor, Inc., Azumio Inc., Allscripts Healthcare Solutions, Inc., Athena Health, Inc., Boston Scientific Corporation, Cohero Health, Inc., DarioHealth Corp., Fitbit Inc., F. Hoffmann-La Roche AG, Health Arx Technologies Pvt. Ltd., Johnson and Johnson, Medtronic Public Limited Company, MetaOptima, NuvoAir AB, SkinVision B.V., Wolters Kluwer N.V., and WebMD Health Corp., among others. 8.4 Ascensia Diabetes Care Holdings AG. 8.5 Allscripts Healthcare Solutions, Inc.
8.15 Health Arx Technologies Pvt. Ltd.
33 Overview- Allscripts Healthcare Solutions, Inc.
35 Overview- Athena Health, Inc.
38 Overview- Cohero Health, Inc.
45 Overview- Health Arx Technologies Pvt. Ltd.
46 Overview- iHealth Labs Inc.
49 Overview- Jana Care Inc.
56 Overview- Wolters Kluwer N.V.
With the emergence of high speed networks, greater accessibility, security and affordability of smartphones, consumers can now effectively manage their busy schedules, and keep a track on their health as well, with a simple click of a button, or the swipe of a screen. The autonomy that smartphones have provided to the consumers has also fueled their willingness to participate in various health related aspects such as, choosing a healthcare product or accessing a medical record or communicating with their doctor using multiple platforms. Mobile applications are playing a significant role in helping the consumers achieve their health-related objectives such as, weight loss goals, nutrition monitoring, disease detection, and, providing easy access to their personal health records. Currently, there are more than 100,000 mobile apps in the mhealth section of the various online distribution platforms. The number is doubling every two years with nearly 200 apps being added each day. Most of the apps are currently being distributed by Apple, and Android through its platforms called “Play Store” and “App Store” respectively. Most of the apps available revolves around general health and wellness of the user such as fitness, nutrition, and reference apps. However, the number of apps focusing on chronic disease management are continuously growing, and currently account for 40% of all the available apps. These apps can monitor, analyze, and store various health related information with respect to several medical conditions such as, blood pressure, heart rate, respiratory disease, skin diseases, pulse rate, diabetes, and many others. Health apps are mobile applications that provide health related services for smartphones, and catalyzes tracking of health information from multiple sources such as, compatible apps or fitness accessories. Over 55% of the health apps downloaded make use of some medical device (connected devices) or consumer wearables such as, Fitbit, and this trend is driven by the demand for fitness and wellness management solutions. The need to diagnose various health parameters, and vital signs with high level of accuracy presents the manufacturers with an opportunity to innovate connected devices enabling portability, affordability, and accessibility, and thus, become an armor for dealing with new health challenges in the process. Although, there are a wide range of apps for a user to choose from, only a few apps generate the maximum number of downloads. This is evident from the fact that there are fewer than 50 apps that generate more than 10 million downloads while more than 85% of all the apps in the app stores have less than 5,000 installations. The reason for high number of downloads of only a few apps in various categories is based on the value that these apps deliver to a patient’s life. These apps are often accompanied by high patient ratings, frequent updates, connectivity to medical devices or sensors, and extensive clinical evidence. With the ever-rising number of chronic disease, these apps could provide an aid to the health systems in saving tremendous amount of medical costs. This can be exemplified in the case of the U.S., where the utilization of health apps for various segments such as, diabetes prevention, diabetes, asthma, cardiac conditions as well as, pulmonary diseases can save approximately $7 billion, annually. The purpose of this study is to gain a holistic view of the mobile medical apps market in terms of various factors influencing it such as, recent trends, and technological advancements. The scope of this report is centered upon conducting a detailed study of different app categories allied with the mobile medical apps market, which include care management apps, medical monitoring apps, health and wellness apps, and medication management apps, among others. The study also focuses on various architectures of mobile platforms such as non-medical device apps, connected medical device apps, and in-built devices medical apps. However, the research study does not incorporate mobile apps intended to be used for billing, administrative or financial purposes within a healthcare organization, and only considers mobile apps meant to be used by either patients or healthcare providers to track, monitor, diagnose, assess, mitigate or cure a disease or medical condition. The global mobile apps market is segmented into four different parts namely, category, type, application, and region. The global market value was estimated using these four different approaches, and was validated with one another. These segments are further segmented into several sub- segments to ease the market estimation and to gain a holistic view of the market. The global mobile medical apps market was estimated at $1.40 billion, in 2016, and is anticipated to reach $11.22 billion by the end of 2025. With the rapid proliferation of mobile computing devices and smartphones in conjunction with growing consumer demand for mobile apps, there has been a plethora of medical apps in different online app distribution platforms such as, Google Play Store and Apple’s app store, and hence the entire market is expected to rise with a double-digit compound annual growth rate (CAGR) during the forecast period. As of 2017, there was an estimated 259,000 medical apps in different app stores, and the number is expected to grow tremendously during the forecast period to approximately 635,000 apps. In terms of app category, health and fitness is the leading segment accounting for approximately 63% of the overall medical app market in 2016, and the segment is expected to be comprising of approximately 3,69,570 apps by the end of 2025. Furthermore, fitness, medical reference, wellness, nutrition, and chronic disease management are the most widely used mobile medical apps in terms of application. In 2016, there were approximately, 67,564 fitness apps, 27,518 wellness apps, 23,002 nutrition apps, followed by 13,483 apps related to chronic disease management. Fitness apps are expected to continue to occupy the lion’s share during the forecast period in terms of revenue generated. Furthermore, application areas such as diagnostics, and remote monitoring apps registered the highest growth rate of 36.7% and 34.9% in 2016, as compared to the year 2015. This significant growth from the remote monitoring segments is primarily driven by the increasing demand from healthcare organisations to monitor patients remotely to reduce the gap between demand, and supply of healthcare services in remote locations, while the extensive demand for diagnostic apps is expected to be facilitated by the rising number of chronic diseases, thus, resulting into a higher growth rate. The global mobile medical apps market is segmented by the geographical regions into North America, Europe, Asia Pacific and Rest of the World (RoW). Presently, Europe is the leading contributor to the global mobile medical apps market. The contribution of Europe to the mobile medical apps market was valued to be approximately 31.4% in 2016, and it is expected to register a double digit CAGR of 29.7% during the forecast period. This high growth rate can be attributed to the rapidly increasing smartphone penetration, and rising number of the government initiatives aimed at assessing the efficacy of medical apps for the benefit of public health. However, Asia Pacific and Latin America are expected to grow at a higher CAGR than Europe i.e. 22.1% and 23.1% during the forecast period from 2017 to 2025. This impressive growth rate expected in these region is primarily due to a large consumer base utilizing smartphones, and technological advancements in the mobile ecosystem. The mobile medical apps market is dominated by companies from various geographical locations. For example: Athena Health, the provider of Epocrates, is based in the U.S., on the other hand, its competitor Wolters Kluwer, the provider of UpToDate is based out of the Netherlands (Europe). The key players who have significant contributions to the mobile medical apps market are Abbott Laboratories, AliveCor, Inc., Azumio Inc., Allscripts Healthcare Solutions, Inc., Athena Health, Inc., Boston Scientific Corporation, Cohero Health, Inc., DarioHealth Corp., Fitbit Inc., F. Hoffmann-La Roche AG, Health Arx Technologies Pvt. Ltd., Johnson and Johnson, Medtronic Public Limited Company, MetaOptima, NuvoAir AB, SkinVision B.V., Wolters Kluwer N.V., and WebMD Health Corp., among others.